Mary Evans (Constance Bennett) is a waitress with aspirations of making it in Hollywood, but she realizes it’s rare to make it big in a town full of people who have the same goal. But while working at a diner, she befriends Max Carey (Lowell Sherman), a director who gives her a big break. On top of her budding screen success, she manages to rope in a millionaire named Lonny Borden (Neil Hamilton) and marry him. It would seem that with a new career and a rich husband, Mary would have everything she wanted – but personal problems arise for the couple, and Mary must also worry about Max, who is an alcoholic. 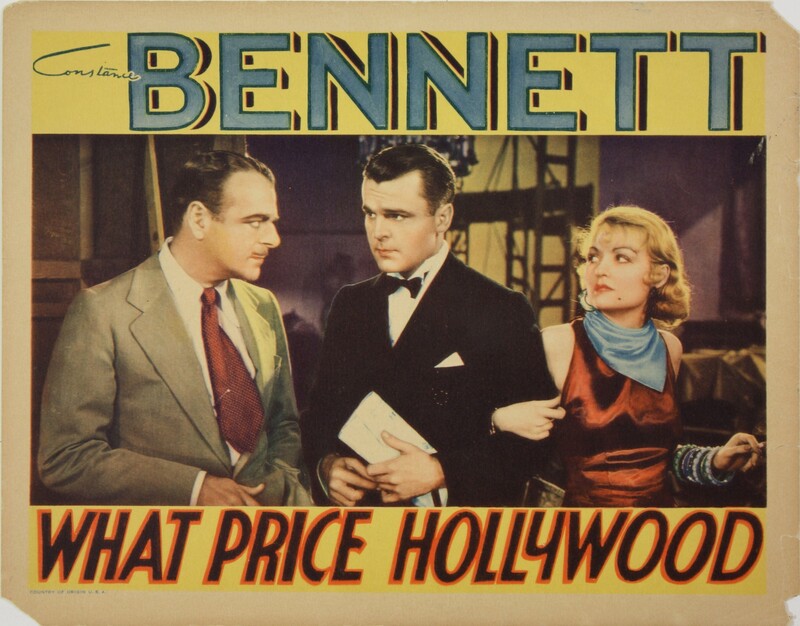 George Cukor directs 1932’s What Price Hollywood? Barely two years into his career at the time of this film’s release, Cukor and his cast offer a scathing pre-code criticism of the industry in which they work. The film paints a picture of absolutely EVERYONE wanting to be in the movies, and goes on to show why those dreams may be more than a little bit delusional. The mood in the beginning of the film is a bit silly. Mary holds a picture of Clark Gable to her cheek, fixes her makeup and hair in a style she sees in a magazine, and generally sets herself up as a bit of a dreamer. She’s quite funny and cute in this scene, which makes the viewer like her. As the film progresses, she’s made even more likable by her drive and determination as her career begins to grow. Things don’t stay peachy for long, despite this fun beginning. Problems such as alcoholism and jealousy soon become apparent. The more Mary’s dreams come true, the more she must face such complications. 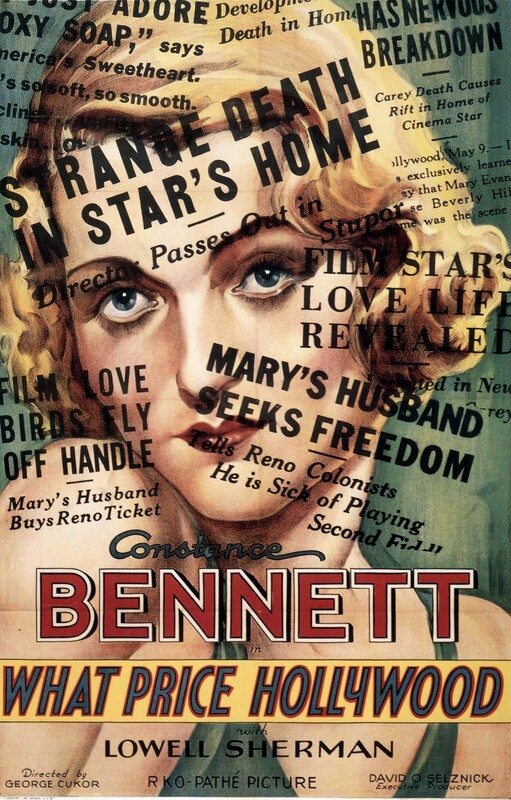 Constance Bennett, in the role of Mary, is very captivating. She has tons of screen presence, sass and wit. Cukor has no trouble pulling energetic performances from Bennett or from the other leads, which in turn gives the film a consistent energy. The story itself provides a mix of comedy, drama, career tale, romance and social commentary. This is a great mix, though the film does have some dull moments. Overall it is engrossing and energetic, but there are a few portions where the pace could be picked up. (SPOILER TIME) In general, these slower periods are redeemed by high impact moments, such as Max’s suicide (END SPOILER TIME). The level of drama picks up pretty greatly in the film’s second half. What Price Hollywood? never becomes quite as high on drama as I expected it to be, but it has no trouble holding the viewer’s attention. Movies about the movie business sometimes have the limitation of only appealing to “movie people” – people who work in the business, or super-fans such as myself (and probably you, since you’re choosing to spend your time reading a classic film review right now). What Price Hollywood? must be given credit for having a wider appeal, because even though it puts a lot of emphasis on the movie business, it has a great leading lady and a great story that delves into both the professional and personal aspects of her character’s life. Hollywood is the film’s focus, but the goal was to offer a true-to-life portrayal of life as a whole in that environment, and the film offers interesting insights rather than the usual ultra-glam angle. I’ve heard this film’s title bandied about many times, but have never seen the actual film. Another one to add to the Netflix Streaming list…and I’m curious to see how the ‘spoiler alert’ moment is handled. And yes, I noticed your jazzy new background! Good idea! I’m thinking about a background change for the Derby Killer at the one-year anniversary, but I’m not sure what I want to do. I’ve kinda grown accustomed to the simple little squares I have now, though. My brother designed the logo, and wants to update it a bit, but I don’t know if I want to lose the original. Have you had the same layout the entire time? I get a bit stir crazy — I think I’ve had about 7 in the past year! I like the logo/layout you’ve got, though. Remember, ‘the entire time’ for me translates to about 3 weeks…I only launched on January 1st! I haven’t got itchy to change it yet, though. And yes, it’s been the same since Day 1. Glad you like the current look…I do, too. My brother wants me to change my header text, to something custom he created, but I kinda like the stark, simple look of that font. I did ask him to change up the current logo for holiday usage…snow or icicles for Christmas, blood splatter on the guy’s knife and coat for Halloween, etc. I like your current look…I think I’ve seen two, and the last one was good, but I think this one is better. So is the layout of the columns and posts. Seems like you’ve had it running longer than that! Great idea to change the logo during holidays. I would have liked to do that during my Horror Half-Week Halloween series but seeing as I use standard text rather than a logo I didn’t have the patience or time to put it together haha. You can always text out the new header text your brother designed and then switch back if you’re not feeling it, but I do agree that the simple font looks very nice. For your Horror Half-Week, I guess you could’ve made the text orange…or maybe blood red! For me, I can’t even test my brother’s custom text; I’d have to pay extra for the WordPress customizing thing, and it was my goal to make the blog completely cost-free. So for right now, it stays as is! And I was only able to order one of those Vincent Price double features (not that this has anything whatsoever to do with ‘What Price Hollywood?’)…apparently there was only one left, and some other clown on the planet who was eager to own it got to it before I did! Ah, I see! I purchased the fonts/colors upgrade last fall just to set my blog apart from the thousands of others that use this layout, but I’m not sure it’s worth $30 since I’m usually the only one who cares about the colors, haha! I was not that person, so the clown remains anonymous! :) I recently splurged on a Kindle in the interest of getting cheaper textbooks (my Art History book was $60-ish as an ebook as opposed to $200 in print, for instance), so I’m on a little bit of a spending ban for the rest of the month. My double feature purchases will have to wait! At first I thought about that upgrade, but I truly like the font and colors of my site, so I’d rather save the $30 for more GB space, if I ever need it. $1?! I might be able to break my ban for that! I thought about putting $5, but then wondered if you might think I was serious about the whole thing, so I changed it to $1! Trust me, if such a deal existed, I’d be buying them all! My first thought was actually that you must be referring to used copies — I’ve bought classics for less than $1 that way before, though not Criterion of course. And then I quickly realized the trickery. I would gladly empty my bank account if I could get every Stanwyck film on DVD for $1 each! And used classics for less than a buck? Sign me up!